This simple dessert is a cinch to make, tastes amazing and is elegant enough for company. You’ll love how easy this is to make! 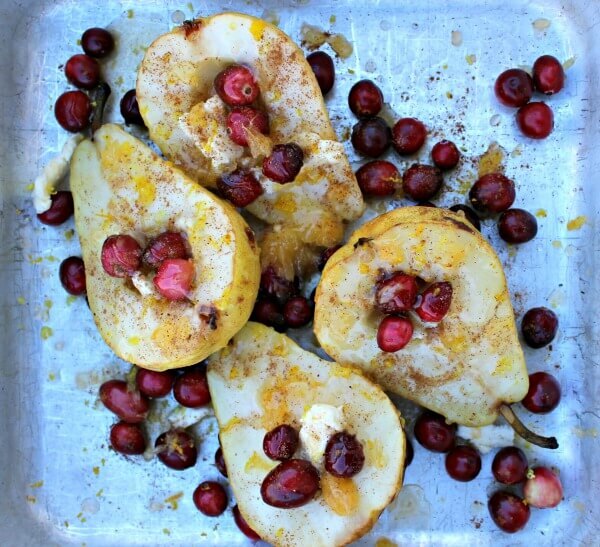 Just take some pears, stuff them with butter and a pinch of cinnamon and nutmeg. Add your cranberries. Then zest a little bit of orange and squeeze the juice all over the cranberries and pears for a punch of fresh flavor. Pop it in the oven for about 30 minutes and this is what it comes out looking like. Yum! Real food is so pretty, don’t you think? 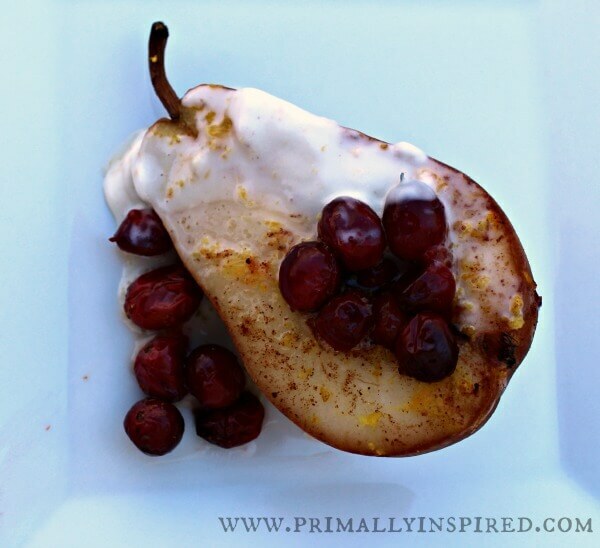 Top each pear half with a dollop of whipped coconut cream and it’s pure heaven, I tell you. Place pears cut side up in a baking dish. Place 1 teaspoon of butter on top of each pear. 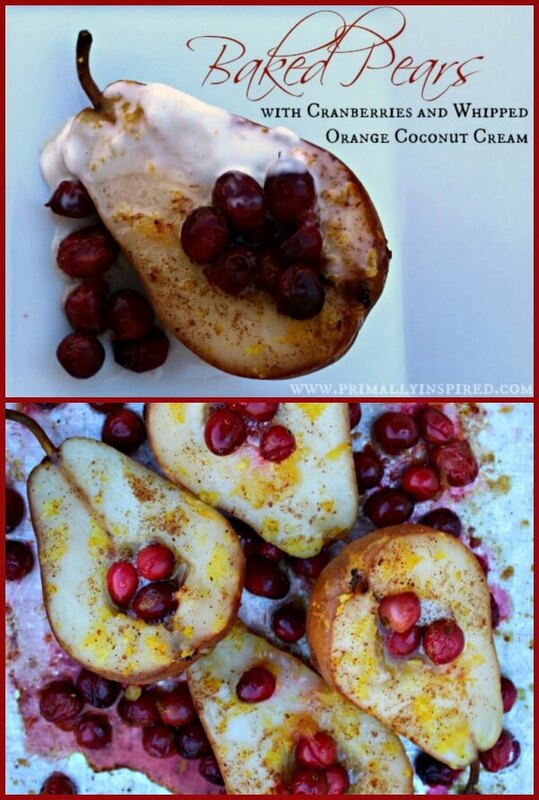 Add the cranberries on and around the pears. 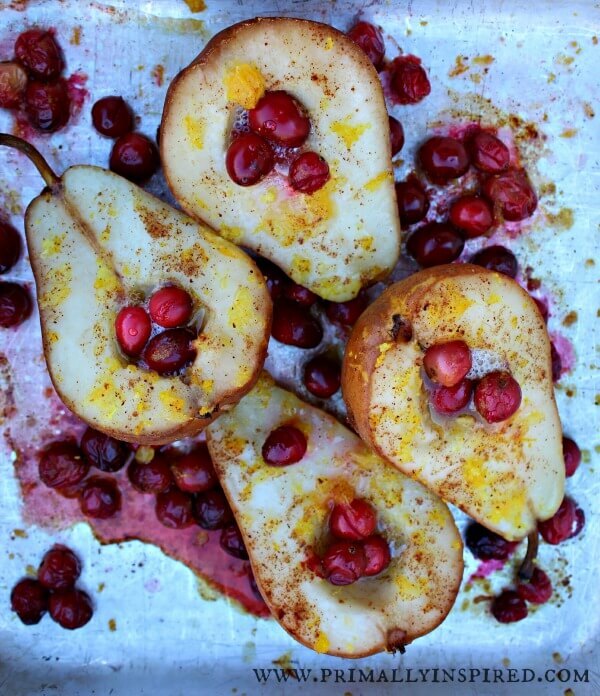 Sprinkle half the zest from the orange half on top of the pears and cranberries. Squeeze the juice from the orange half over the fruit. If you are using honey, drizzle honey over the pears. Bake for 25-30 minutes or until pears are softened. 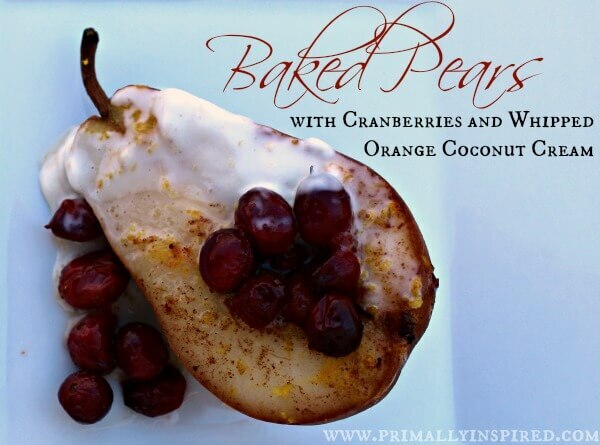 Top with whipped orange coconut cream and enjoy! With a stand or electric mixer, whip coconut cream until peaks form. Add in the other half the zest from the half orange, vanilla, honey and pinch of cinnamon. Continue whipping until well incorporated, about 15-30 seconds longer. Do you have a favorite dessert you like to serve company? This looks great. What type of pears do you use? I’ve been using bosc pears, but any will work! 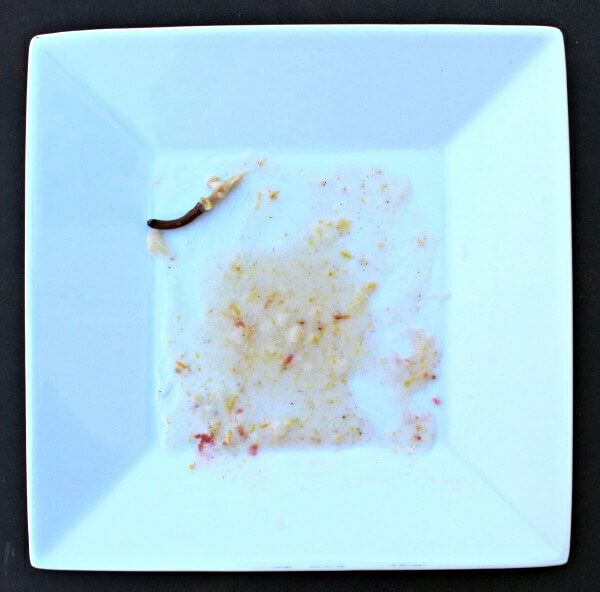 This recipe is a great paleo recipe, but it is not Whole30 compliant. It needs to omit the honey and sub vanilla bean or powder for extract. This recipe looks great (although not true to Whole 30 as previously mentioned). I am doing Whole 30 for the first time for the month of September. I think I will do something like this as dessert for my Autumn Equinox feast. Maybe I’ll just simply skip the cranberries so I can easily omit the honey. Thank you! This recipe is fantastic! I needed a break from eggs on my whole30 so I made the necessary adaptations and added chopped almonds for some protein. Perfect breakfast for the first day of fall. Woo! I hear you on the needing a break from eggs every once in awhile!